We generally think of grief as the process we go through after someone we love dies. What many people are not familiar with and don’t completely understand is preparatory grief, which the process that caregivers frequently experience as they have to continually adapt and adjust to the ongoing losses and changes suffered by a loved one who has a long-term, progressive and degenerative disease. Preparatory grief is not a linear process. Every time your loved one experiences another loss, you grieve that loss and you go through a period of adjustment. You eventually come to accept this “new normal,” and you think you’re getting along just fine. Then something happens that reminds you of what life used to be like, and the reality of your losses hit you like a ball bat in the chest. 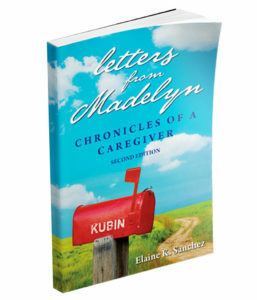 In this excerpt from my book, “Letters from Madelyn” my parents receive an invitation to an event that reminds Mom of who Dad had been before the stroke. Her feelings of loss and grief overwhelm her. Writing this letter helped Mom cope with this episode of preparatory grief. If you’re experiencing caregiver loss and grief, I hope you’ll find a safe place to vent. Join a support group. Call a trusted friend. Seek professional counseling, or contact your clergy. The important thing is to acknowledge that your feelings are real and extraordinarily painful. Sharing your pain won’t make it go away, but it could make it a little easier to bear.